Load up on some cool home decor and accessories at unimaginable prices from this shop. Plus they are all made by village women so you can do your bit to empower them. Enter Dakhshinapan and right from where the market starts, you will find this small stall in front of the Basanta Sena store. Here you will find a number of small eye-catching accessories like bags and phone cases, dupattas and home decor accessories. 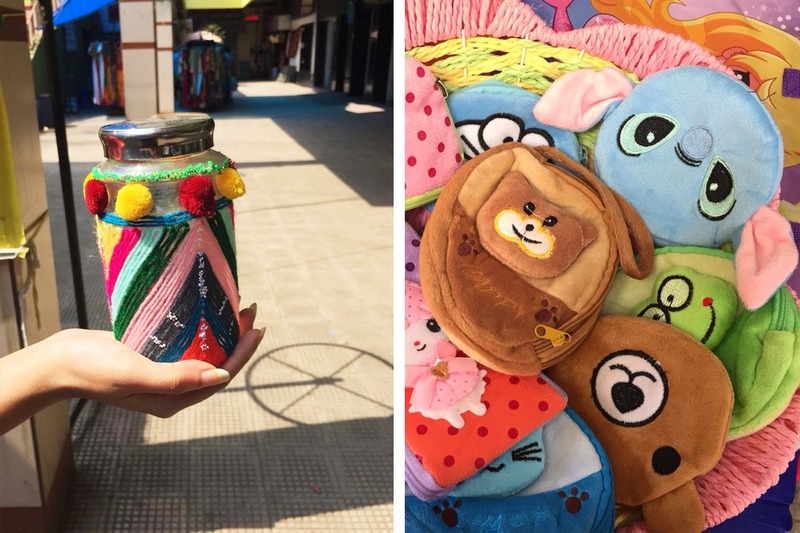 We especially loved the cute animal-shaped purses and phone cases, all handmade and between INR 50 and INR 75! Very useful for keeping your chhutta handy. The bag made out of different saree borders is also eye-catching (a steal for INR 350). Other bags that we found here with colorful weaves and mirrorwork designs are also quite uncommon and go very well with ethnic wear. And they also stock bags made with newspaper, so you can ditch the polluting plastic ones. The collection delightfully random. You get home décor stuff like pretty ice-cream and cartoon-shaped candles (for INR 30-50) and pretty jars decorated with colourful threads, pom poms and beads (for INR 300) and the cute pink woven basket that can be used to keep just anything. What makes these products special is that they are made by women from the villages of Uluberia. The owner, Lopamudra Palodhy, decided to give a platform to these talented bunch of women who love crafts.